We did this review based off of our followers request. Honestly we had not heard to much about TruVision Health or the products they make. After multiple request for us to review the product, it seemed like a perfect time to put this company to the test. We utilized the product truWEIGHT &amp; ENERGY for a full cycle, 30 days. To get our supply we ordered straight from the TruVision website. We do this as we like to see how the company interacts with their customers. One thing that we found was interesting, when clicking on the product to order they gave three prices: Retail, Preferred Customer, Associate. We found this a bit interesting to have all of that information out there. Made us feel like we were over paying for out products. Now, this is not a business review website so lets get into the actual product. TruWEIGHT &amp; ENERGY is promoted to help you &quot;lose body fat, make you feel more energized, and it does all of this with no special diet needed.&quot; Now, we are not naive and know that even though they claim &quot;no special diet needed&quot; … if you want to get results you will need to follow a sensible plan. As well as have some sort or structured exercise routine. We will get into the results of our nutrition plan and truWEIGHT &amp; ENERGY in just a minute. First lets go over some of the ingredients. When you are on the website they do a phenomenal job of explaining what 10 ingredients are in truWEIGHT &amp; ENERGY. There are even a few sentences that explains what the ingredients help with. We found these informative and accurate. Only downside, there is no picture of the label or ingredient panel. He had to search it through google images to be able to see it. When we found the label, it became clear why they did not have the label on their website … the whole blend is going to be 465mg per capsule, which means in a 2 capsule serving you are getting 930mg of ingredients. Considering that multiple ingredients need 200mg or more to be effective, it seems that truWEIGHT &amp; ENERGY is under dosed. Now, even though the product seemed to be under-dosed we did notice an increase and energy across the board while taking truWEIGHT &amp; ENERGY. Since this product is not gender specific we found that the energy was good for both genders. Simply taking the 2 capsules in the morning and the 2 in the afternoon kept us energized for the day. Well actually all 30 days. Around the start of the fourth week we did notice that we were not noticing the product as much. This is typical anytime you take stimulants consistently with no days off. For this reason we would say that after each 30 day cycle, taking a week or two with out truWEIGHT &amp; ENERGY and little to no caffeine is a great idea. After 30 days we did earn some results. Most of us on staff lost a few pounds! We did not see any double digit results. Even those of us that have more to lose did not break the double digit barrier like they did with the Bliss Go Pack. We did find that the weight loss was a little bit better for the men, which unfortunately is not that shocking since women have a harder time losing weight throughout the whole month. If one chooses to return product and it’s in resalable condition, you will first need to get an RMA #. To receive the number, please call customer support and they will take you through the return process. Sending back product without first contacting customer support will impede any kind of refund or company credit. Overall, truWEIGHT &amp; ENERGY gave both males and females good energy for the day. Since we did notice some weight loss truWEIGHT &amp; ENERGY is far from the worst product we have reviewed. It is also not in the running for the best either. 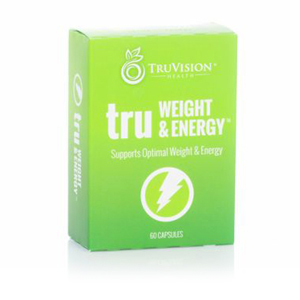 We found TruVision truWEIGHT & ENERGY to be a middle of the pack product for energy, weight loss, and effectiveness. Please remember though … WE DID FOLLOW A SENSIBLE NUTRITION PLAN & EXERCISED. TruVision has opportunities for a one time purchase or an autoship program. If you do decide to purchase the product please make sure you know what you are ordering and signing up for. Make sure you truly want to try the product as there return policy is below par for the industry. Which makes us question … how much does TruVision believe in their own product? Fat Burner Reviews Copyright © 2019.